Located at the corner of Martin Luther King and Shine Street, this 27,000-square-foot building houses classrooms, faculty offices, studio spaces, lounge areas, and art gallery. Studios dedicated to ceramics and sculpture open onto porch areas where ceramic firings, bronze casting and glass blowing activities take place. Spacious drawing, painting, printmaking studios, and individual senior studios are on the second level. A ground-floor suite offers two Mac labs and conference areas where Graphic Design students are able to work together in a setting similar to an ad agency. 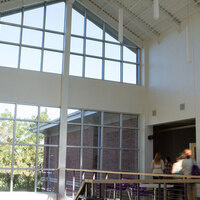 Ample display areas for student and faculty art are enjoyed throughout the building. Come join us to celebrate the publishing of the 2019 Baylorian, April 30 at 6pm, Baugh Center for the Visual Arts. The presenter was great and incredibly interesting! The only issue I had was that the FAE had not advertised that people needed tickets, so it was fairly crowded. Loved the refreshments, enjoyed going to each 'ornament' station, students and faculty were great, plenty of things to do but small and confined to one room.....need a bigger area! It was a fantastic event! I loved seeing all the art from the other students. My family came with me to see where my art was displayed. I had two pieces showing and what a wonderful feeling! What an honor to meet such an inspirational artist and unexpected philosopher! Her work was spectacular and thought provoking, as was her wisdom and experience. Thank you for such a wonderful experience. I enjoyed Carlos' informative powerpoint and his great personality. I really liked his use of color in his screen printings. I loved the contrast of the two artists. Each had a voice for their own style, which was vey impressive. I will be looking for their work for sale in the near future, whether it be in galleries or film, I know they will succeed. This is event was unique.